Sir Arthur Conan Doyle and the Pterosaurs. | Letters from Gondwana. 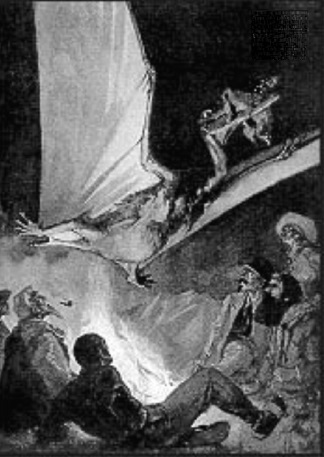 Sir Arthur Conan Doyle and the Pterosaurs. 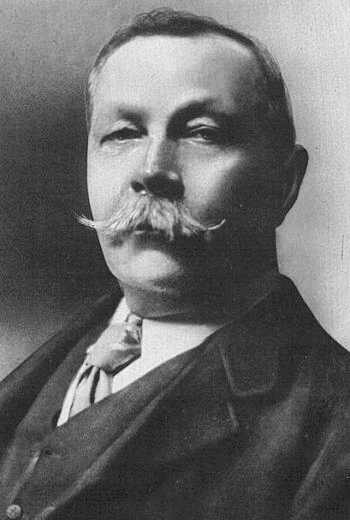 Sir Arthur Conan Doyle began to write The Lost World in 1911. One year later it was published in book form by Hoddar and Stoughton. By that time he already was one of the most popular author around the globe, thanks to his most iconic creation, Sherlock Holmes. It’s well documented that Conan Doyle had a great interest in paleontology. He attended several talks on fossils and among his friends were Ray Lankester, Charles Dawson and Arthur Smith Woodward. He was part of several palaeontological digs and also visited the now infamous Piltdown Man excavations in Sussex. Pterosaurs are an extinct monophyletic clade of ornithodiran archosauromorph reptiles from the Late Triassic to Late Cretaceous. Pterodactylus is a genus of pterosaurs, popularly known as pterodactyls. The first pterosaur discovered was identified in 1784 by Italian scientist Cosimo Collini but was Georges Cuvier who coined the term “Pterodactyle” in 1809 after the discovery of a fossil skeleton in Bavaria, Germany. 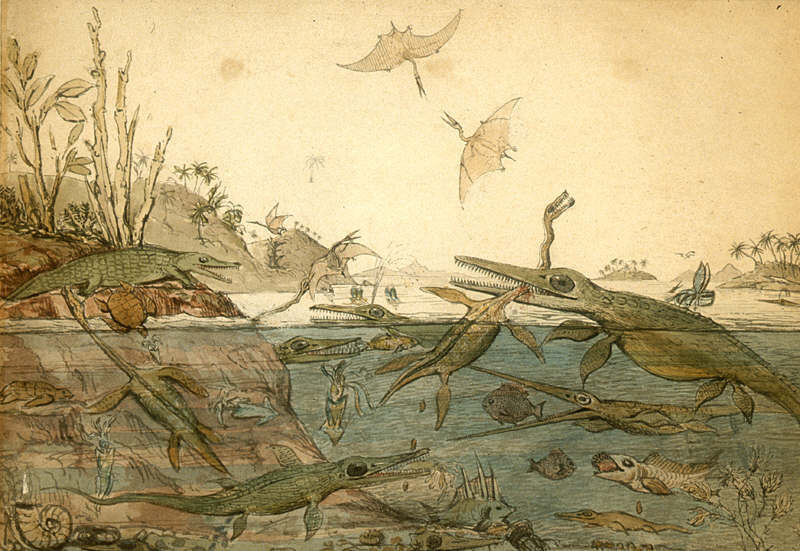 Although, the first published depiction appears to be in the watercolour Duria Antiqior by Henry de la Beche, where several pterosaurs are seen flitting over a scene of ichthyosaur and plesiosaur, representing the Liassic Sea based on fossils found by Mary Anning. Richard Owen’s (1870) also included a short chapter on pterosaurs in his classic text book “Palaeontology”. But probably, one of the most influential works in Doyle’s novel was “Extinct Animals” by Ray Lankester. The book was published in 1905, with a short chapter dedicated to pterosaurs where he emphasized the shape of the wings and supported by detailed illustrations. The Lost World, has much in common with ”Journey to the Centre of the Earth” by Jules Verne. This book was published in France in 1874 and it was Verne, who first introduced Pterosaurs into popular fiction. But there’s a profound contrast between the treatment that both writers gave to Pterosaurs. In “Journey to the Centre of the Earth”, the pterosaurs had a small presence while in “The Lost World”, pterosaurs are central figures. Later, the protagonists discussed over the correct identification of the genus: Are they Pterodactylus or Dimorphodon? Throughout the story the pterodactyls appear and reappear, attacking them and stealing their food. Finally, one is captured and brought back to London and it’s presented to an audience at the Zoological Institute, but the creature makes its escape through an open window. No other animal receives such continued treatment throughout the book, or is illustrated in such detail. This could indicates that Doyle was fascinated by pterodactyls. The Lost World novel has been so immensely popular that it has had a lasting effect, and has contributed significantly to the fascination with dinosaurs and pterodactyls. Even more, the first full-length animated science fiction film was based on Conan Doyle’s novel. This is a trailer of that movie. In 1994, Arthurdactylus a genus of pterodactyloid pterosaur from the Lower Cretaceous of Brazil was named in honor of Arthur Conan Doyle. Love those pterosaurs, and Arthur Conan Doyle too. That’s why my novels and short stories always have at least a cameo appearance by one or another of those fuzzy fliers. Great post @ferwen!! loving your scientific-divulgative-skills! (we need more of people like you, acting as a link between scientific and non-scientific people). Pterosaurs are not my “most loved archosaurs”, but still deserve my respect. They are very difficult to draw…. Thank you. That’s so kind of you! He is one of the greatest authors of all time. This is a example of his creativity and imagination.